Do you ever notice how one little compliment on your outfit or a job well done can put you in a better mood for hours? I love that feeling - the feeling that someone noticed and was thoughtful enough to say something nice to me. I had an appointment the other day where I got 3 compliments on my shoes. Three! I was on Cloud Nine for the rest of the day. 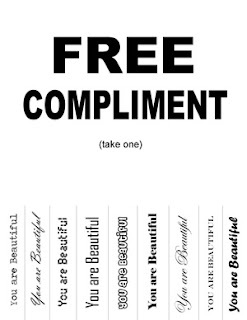 The funny thing is, giving someone else a compliment is just as good (if not better) than receiving one. A few weeks ago, I saw this cute little old lady in the grocery store wearing a bright red trench coat. Believe me, I love a classic trench and red is my favorite color, so I thought this coat was fantastic. As I walked past her, I touched her shoulder lightly and said "I love your coat." This was not something I felt super comfortable doing (I'm so not a touchy-feely person and I don't like talking to strangers), but she absolutely beamed when I said that. Her whole face lit up and you could tell she was strutting a little in that coat down the grocery store aisles. And as good as she might have felt receiving the compliment, I guarantee I felt a thousand times better giving it. And then I started thinking, why don't I compliment people more? Who doesn't love a compliment? It's easy enough to compliment friends, but why not brighten the day of complete strangers as well? It sure brightened my day. So, I'm challenging myself to give at least 3 compliments a day to 3 different people I don't know. On their clothes, jewelry, hair, work, shoes, pets...anything really. It's such a tiny action, but can have such a wonderful impact on your day. Do you give compliments to strangers? Well, I can't see your outfit, so, I can't tell you how cute you are, but, you always are, so, there's that. And you have a super cute house and the cutest freaking pets ever. Also, how many times can I use the word "cute" today? Sheesh. Love this! I am always urging myself to give in to my nicer impulses more often, because I will see someone with a cute bag or cute shoes or great hair or an adorable child and want to say something... and then I don't because it feels weird. But I know I would feel AWESOME if someone complimented me! I still remember the time a stranger stopped me in a Macy's and told me she loved my hair. It made my whole day. Love this idea! Compliments are the best especially from strangers! So sweet of you to make that little lady's day! i did something similar a few weeks back. i was at the post office and this little old woman walked in. she seemed frail and i'm guessing she was round 80ish. her hair was completely dyed dark brown, all pouffed out like she'd had it sitting in giant rollers all day. she was wearing red polyester pants with a matching red polyester vest, a black dress shirt that had a ruffly ascot hanging out over the vest, and tiny little mock (wedge) high heels. the icing on the cake were the giant Jackie O. sunglasses. as soon as i saw her i thought "I WANT TO BE HER WHEN I GET OLD." Yesterday I was talking to one of my clients. She told me "talking to you is like a Christmas present". Totally made my day! I am totally the awkward person that compliments complete strangers. About half of the time, they think I am hitting on them or psycho. The other half? They love it. And it feels so good! This is so true...I feel so great after someone compliments me, and also after I compliment someone else. But I don't ever think to do so...I need to start complimenting others more often, there are so many great people out there! perfect post! i always try to compliment people if i like something they're wearing or notice they look extra good, because i know how good it makes me feel when it's done for me! Oh I love compliments, both giving and receiving! It really does brighten my day. this is a fabulous challenge. I've been trying to do something similar. I was finding that I would speak out to managers when I felt that service at various stores/restaurants/etc was lacking (or just terrible) so I also wanted to do the same when I got extraordinary service. I don't know if it makes any difference but I definitely think a bright smile from a store clerk makes a difference in MY day.